DumpsOwnerYasu IgarashiVehicle’59 Chevy Impala, “Aqua Boogie”City/StateSanta Fe SpringS, California ClubSouth Side C.C. We spotted this fine ’59 Impala at our recent San Bernardino, California, Tour show and we just had to bring you a sneak peek of the trunk compartment and its unique custom setup that can be appreciated by old-timers as well as the new generation of lowriders. 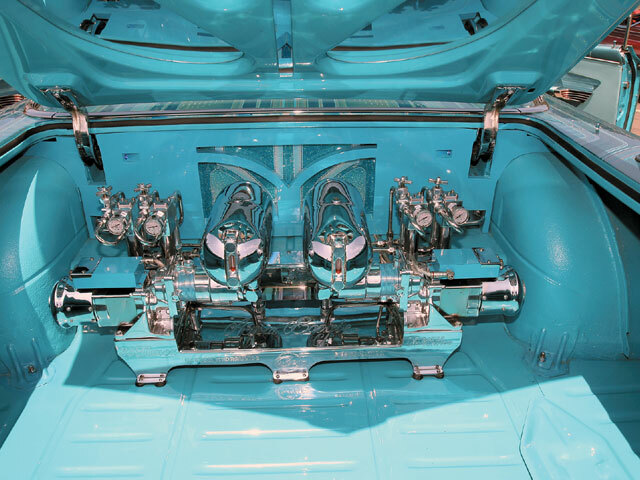 The Impala was put together by Yasu Igarashi of Craps Restoration in Santa Fe Springs, California. The trunk has a pair of Emco motors with Strada power motors or New York Air Brake Company motors. These motors were originally used for anti-braking systems in old fighter planes. This setup was assembled in four months and features four original Adel square valves or dumps (as some of us know them) that were found by Igarashi’s friend Eric in a Midwest surplus store. Other original era parts used for the setup include two pilot bail-out oxygen bottles now doing duty as oil reservoirs. Four #8 zig-zag slow-downs control the fluid’s return through the custom tubing and fittings bent by Igarashi. The setup is powered by four Optima batteries hidden under the package tray; powered at 24 volts as these pumps sound best at that voltage. With the complete setup being as compact as it is, Igarashi has the rest of the trunk to do whatever he feels like, from installing a sound system to leaving the room to haul an ice chest. The detail and uniqueness that Igarashi displayed in this setup earned the car a well-deserved spot in our Dumps & Bumps section. This month, we’re featuring Bruce Folwell’s ’63 Impala from Las Vegas, Nevada, in our Bumps department due to the car’s clean sound system. The system’s nothing too big, but enough to catch our ear while we were shooting the vehicle in the studio. Thus, we had to bring you an advanced look at this trunk system. 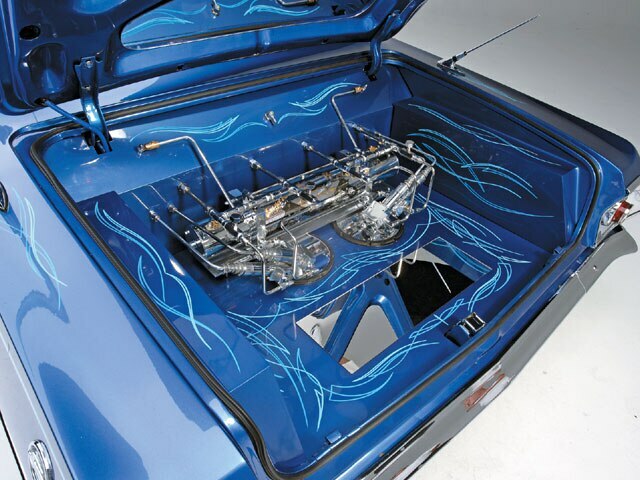 The trunk of this Vegas convertible features the best of both worlds-a hydraulics setup that can show it all and a sound system that pushes the beats clearly when turned on. The trunk has a whammy-style setup to allow the most space for the audio and batteries. The batteries powering the setup are hidden underneath the fiberglass panels that were painted to match the exterior of the vehicle. The trunk tub is used to house the JL Audio 12-inch subwoofers and Eclipse amplifiers that power the speakers. Gabriel at C&L Customs in San Fernando, California, performed the installation and “Chino” of the same shop dressed up the trunk and made all of the fiberglass panels. Pioneer 611/42-inch midrange speakers are located in custom pods in the interior. This awesome audio system sounds as good as it looks, and it definitely caught our attention. Make sure to keep your eyes and ears open for a full feature on Bruce’s “Sin City” ’63 in a upcoming issue of Lowrider Magazine.